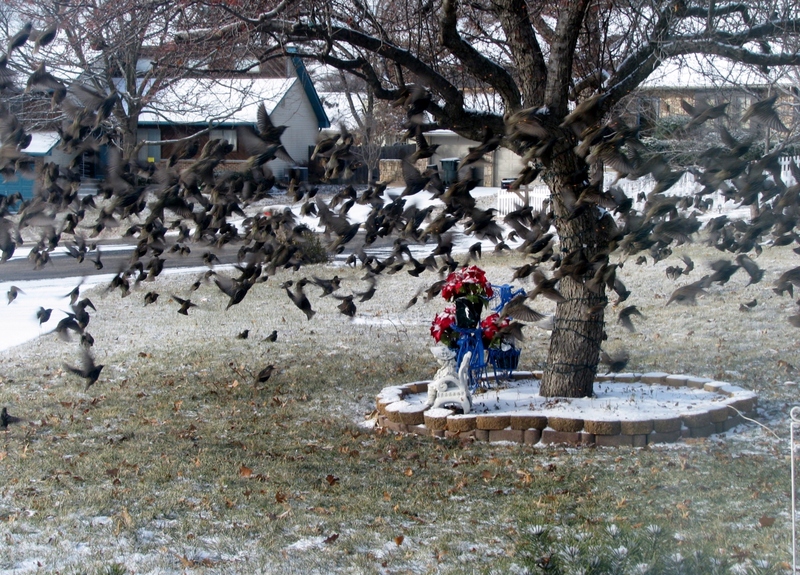 This morning all these birds came flying into the front yard. It looked like a scene from the movie “The Birds.” The miniature apples from our “Adirondack” crap apple tree were ripe and following from the tree. The birds also come to eat the apples about this time. As the weeks pass, the fruit from the tree ferments. As the birds eat the fruit they become drunk and start hitting the front windows. The birds are enjoying the fountain in the front yard. At times they seem to be fighting with each other to get their space and time in the water. The birds also fly into the window as if looking for somewhere to land and stare in to see what we are doing in the house. What is in the bird house? The last couple of weeks we have been watching the squirrel go into the bird house. First time it was snowing very hard and on this day it was cold and windy. I donâ€™t think the birds have laid any eggs yet so not sure what he is afterâ€¦.just staying warm maybe? 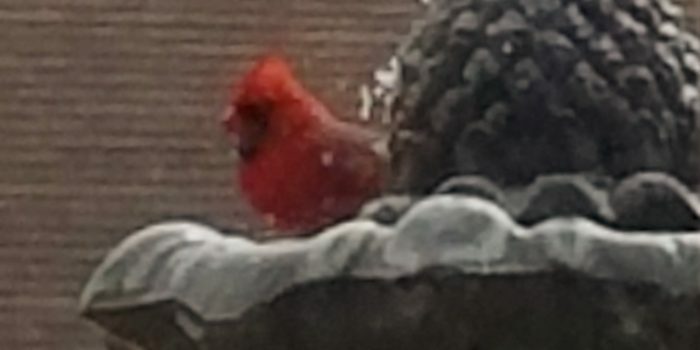 We had put out bird seed and of course, he came to eat before he climbed into the house. These two birds were sitting on top of the house watching the crazy squirrel. Â Every morning and afternoon we have a humming bird that comes to drink from the fountain in our front yard. We think itâ€™s the same one but it could be different ones. One morning Steve said there was a baby that came with the mother for a drink. These are the pictures I snapped this morning. This is a picture I took last year of a visit later in the day when the light was much better. I think this bird is looking around for spring and thinking about moving into one of the apartments in our backyard.